Charlotte, NC –Stand & Deliver, LLC, a professional development firm, will host the Fifth Annual Charlotte Professional Networking Week January 22-26, 2019 in various locations in the greater Charlotte metropolitan area. Professional speaker and networking expert Carlos V. Davis, who serves as Stand & Deliver’s chief empowerment officer , is the visionary behind Charlotte Professional Networking Week. Charlotte Professional Networking Week is designed to provide the city’s professionals with the essential tools, resources and networking opportunities needed to develop, brand, market and operate their businesses successfully in today’s climate. Unlike typical professional development conferences, intentional networking, as the event title suggests, is incorporated into every aspect of networking week. This type of networking promotes meaningful relationship building, which is an integral component to a thriving business community . “My hope is that attendees come away with opportunities to improve their career along with professional resources and knowledge that can help them with those opportunities,” says Davis. In commemoration of the fifth-year anniversary, Judge Glenda A. Hatchett will headline Charlotte Professional Networking Week as a special celebrity guest. Hatchett is best known for presiding over the two-time Emmy nominated nationally syndicated show, Judge Hatchett, now in its 18th season (Sony Pictures Television) that also won a Prism Award for Best Unscripted Non-Fiction Series. Recently, Hatchett has returned to TV in her new court series, The Verdict, which marks Entertainment Studios’ sixth current court series on JusticeCentral.TV. In addition to Hatchett being a highly recognizable television personality, she is also the author of national best-selling books, Say What You Mean and Mean What You Say (Harper Collins, 2003) and Dare to Take Charge (Center Street / Hachette Book Group, 2010). The multiple award-winning Hatchett is the founder of The Hatchett Firm, P.C. located in Atlanta, GA. The firm specializes in risk and crisis management and catastrophic police misconduct cases. Hatchett will share her story during a highly anticipated fireside chat at The Professional Opportunity Exchange event on day two of networking week. Image: Networking In Style (Tuesday, January 22, 6:00 p.m. – 8:00 p.m. at QC Social Lounge, 300 N. College St. Suite 105) This after business hours event will treat guests to an evening of impeccable style. Attendees will network in a beautiful venue and experience fashion presentations and runway shows that will feature some of Charlotte’s best established and emerging fashion brands. The show is co-produced by JSW Media Group and J Model Executives, LLC. The Professional Opportunity Exchange (Wednesday, January 23, 11:00 a.m. – 2:00 p.m. at the Charlotte Regional Business Alliance, 330 S. Tryon St.) This event gives attendees an opportunity to network with both one another and participating vendors and sponsors in an upbeat, low pressure atmosphere. In addition to networking and the fireside chat with Judge Hatchett, some attendees will be able to interview with area corporations for business contracting and job opportunities via Professional Speed Connection Sessions. Connecting The Dots: Professional Connections Luncheon (Thursday, January 24, 11:00 a.m.-1:30 p.m. at Hampton Inn & Suites Charlotte – Phillips Place, 6700 Phillips Place Ct.) An opportunity for guests to mix, mingle and network with vendors and other attendees while enjoying a complimentary catered lunch. The Move and Shake Experience: A Professional Development Expo (Saturday, January 26, 10 a.m. – 2:00 p.m. at The Carolinas College of Health Sciences, 1200 Blythe Blvd) This is an expo focused on providing professional resources and information through vendors, informative seminars/workshops and keynote speakers. All Charlotte Professional Networking Week events are open and free to the public. The Kevin Gray Agency (Allstate Insurance) is a Signature sponsor for the week. The Freedmen Law Group and Carolina Small Business Development Fund are both Supporting sponsors; and Rae & Shelly’s Creations is the food sponsor for the week. There are still a few open spots for vendors and sponsors; for sponsorship information call 704-916-9643. For all other details, locations or to register, visit charlottenetworkingweek.eventbrite.com. To schedule media interviews with Carlos V. Davis or to obtain press credentials for any other the official Charlotte Professional Networking Week events, contact Jameka Whitten at 704.965.3297 or jameka@jswmediagroup.com. On-site interviews will also be available. Charlotte Professional Networking Week, presented by Stand & Deliver, LLC, is a weeklong series of events that leverages professional networking opportunities to connect area professionals with the tools and resources needed to excel. The mission of the week is to be a venue for the professional community in the focused areas of entrepreneurship, philanthropy, and employment. 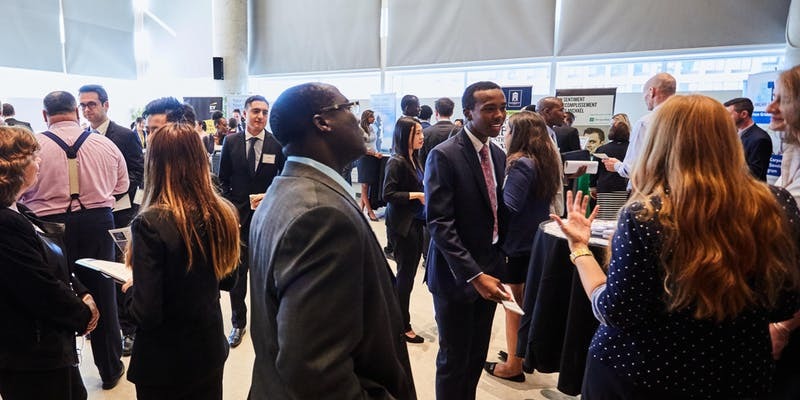 From gaining new clients to getting new funding and acquiring the proper training to secure a job interview, there is something for everyone during the week regardless of age, professional background, or industry.